What is Reputation Takeover? Another Scam? If you have received some promotional material of this newest product, and are wondering what is Reputation Takeover, you have landed at the right place. Can you really land clients without selling to them, by offering to help them fix their bad reputation? Is this going to make you recurring income? We will be answering these questions and more in this article. But before that, let me congratulate you for taking the time to do your own research, before deciding whether to make your purchase or not. Let me assure you that I have no association with the product. So my Reputation Takeover review is going to be completely honest and unbiased. 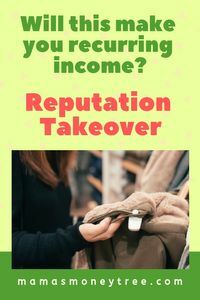 Let’s dive right in, find out what exactly is in this Reputation Takeover, and how does it work exactly to help you fix your clients’ bad reputation and make you recurring income. Reputation Takeover is a lead generation system that helps you, as a consultant, identify and contact clients who supposedly have a poor reputation due to bad reviews, so you can offer your services to help them improve their reputation. There is training on the various methods that you can teach your clients to use, to get positive reviews. My general sensing about this product is: it would be difficult work to land clients, and to make them want to pay you a recurring fee. Because once they learn to increase the number of positive reviews from what you will be teaching them, they actually do not need your service anymore. Moreover, this is trading time for money, where you are running an actual marketing consultancy. It involves lots of time and effort in face to face meetings, engaging in negotiations to settle on an agreed fee, setting targets, scope of work, etc. Read on for the detailed review of Reputation Takeover, and why I recommend it if you are looking for a real job that requires lots of time commitment. To answer this question: what is Reputation Takeover, let’s first take a look at the information presented in its sales video and landing page. So this is a system that increases positive reviews, improves reputation and increases revenue for any business, while earning you recurring monthly fees. There is also a software for landing clients. It is called RepLeads, and it is actually quite cool. Its functions include searching for businesses, managing those businesses, as well as a marketing portal. Basically you select an industry, the software will show all the businesses together with their star ratings. Then from the list, you select the potential clients, which are those with low ratings. It will then bring you to specific reviews that you can read, about what customers say about those businesses. Next you select those negative comments that you want to send to your potential clients through emails. This is what the creators of Reputation Takeover mean by using the foot-in-the-door, pain point service that no business owner can ignore. I think this is a great strategy, as I’m sure no one would feel comfortable reading the most negative reviews about their products or services. Within the RepLeads software, you also get numerous email templates that you can use, with copywriting that specifically targets this pain point of negative reviews. After going through the training, it basically positions you to advise your clients on how to get more positive reviews from their customers. Frankly, after viewing the sales video and landing page of Reputation Takeover, I was impressed by the sincerity of the creators, and the authenticity of the product. There is no hype at all. It gives you the tool to land clients, and equips you with the knowledge to help them increase their ratings, and improve their reputation. It does not promise that you will earn thousands of dollars within the first month or anything like that. Which is very refreshing, in comparison with so many other products that I have reviewed before this. In the next section, let’s consider the real work behind this marketing consultancy business. The whole concept behind Reputation Takeover is very unique and interesting. And I believe it will add value if you already have a marketing consultancy portfolio. If you think about it, most people do not actively go on available platforms to leave positive comments on a product or service, even after a great experience with it. But if the encounter was a negative one, you can be much more certain that people will make their voices heard. So if a business does not actively engage its customers in providing reviews whenever they had a positive experience, their rating would become skewed. This means there is a huge potential for you, as their marketing consultant, to come in, point out the negative reviews to them, and teach them how to improve on this aspect. The thing is, the methods are easy to understand and implement. Collect customers’ emails so you can follow up with them for their reviews, provide incentive when customers give their reviews, get them to provide reviews on checkout, etc. This means there is no reason for the business owners to pay you a recurring monthly fee. It may work as a one-off project, where you propose that you have ways to help improve their ratings, and you negotiate a price for this project. Then it would become a case where you are trading your time for money, just like any regular job. You would have to keep landing clients, offering your service, negotiating on the fee and job scope, implementing your strategies, etc. At first glance, with the RepLeads software, it seems like a very simple job, which can be done in a few clicks. No doubt the software can save you a lot of time and hassle identifying and landing clients. But the real job comes after sending out those emails. You can’t expect agreements to be made, without even having met you in person. So there will be face to face meetings to agree on the terms of payment. Then you would have to coach the business owners and their team on the strategies to increase their rating. Every single client, you have to go through these, taking up your time. And I really do not see the potential for recurring fee in this service. If you are looking for a make money opportunity that offers more time and space flexibility, then I can suggest a better option than this Reputation Takeover. I am working from home, and earning my online income. I enjoy the flexibility this business model provides, because I get to choose when, where, and how much I want to work. There is no boss to report to, because I am actually building my very own online business. This is also something that can be built into a passive income stream, if you are willing to put in the hard work at the start. The business model is called affiliate marketing. Simply by sending customers to the virtual doorstep of vendors or suppliers, I get paid a commission when they make a purchase. This is how many successful internet marketers are making their money online. The potential for this market is huge, because everyone is doing their shopping online nowadays. I do not have to go and look for customers, because with the method I use, the customers are the ones who come looking for me, ready to purchase stuff that I recommend. The owners of Reputation Takeover are real people with lots of experience in helping businesses with their marketing. Personally, I find that they are sincere in delivering a product that works. This basic refund policy is in place, for people who are dissatisfied with the product. But do note that it is not the ‘no questions asked’ type of refund policy. They require you to have at least taken some action towards implementing the ideas contained in Reputation Takeover. The software is a great tool that can save you hours sitting in front of your computer, looking for potential clients which have lots of negative reviews to their businesses. The training is also useful, in equipping you with the know-how to coach the business owners on increasing their positive reviews. It is a real job, requiring all your hours and commitment, going out to meet potential clients, and trying to convince them to take up your service. The day you stop working, your earnings stop too, as it is a simple job to coach the business owners into improving their reputation, so they will not need you anymore after that. There could be businesses that have some issues at the core of their products or services. Without addressing those, there would be no way they could get more positive reviews than negative ones. So you need to be skilled enough to have an eye for what is missing in their business, before you can help them. These are the upsells of Reputation Takeover, which will be promoted to you right after you purchase the front end product. Is Reputation Takeover Scam or legit? This is definitely a legitimate product, which will add value if you are already in the marketing consultancy business. A few other useful products I have reviewed include Uduala, Six Figure Success Academy, and ConversioBot, to name just a few. I do not recommend Reputation Takeover, if you are looking to escape the rat race. This is no different from any other job that requires you to trade time for money. However, I do recommend this next business model that I am going to show you. This is what has allowed me to work from home, while being there for my kids. If you have any concerns or questions regarding this Reputation Takeover review, do comment below, and we will start a conversation from there. What is Uduala? Another Scam? Does AZ Millionaire Method Scam You?